Personally, Zuma’s Revenge! probably wouldn’t be the first thing I’d want to call a video game. That is unless, of course, the game is meant to be played on the toilet after drinking the water in Mexico. I guess I don’t see any reason why this game couldn’t be played on the toilet. Zumba’s Revenge tells the heart-rending tale of lifelong jazzercise aficionado Jessica Mortensen who, on one fateful night, was struck and killed by a van full of marijuana -addicted teenagers. She is resurrected by her rodeo clown brother using dark carnie secrets. Now she must take revenge on those who’ve done her wrong, dance-fighting the pot-smokers to death with a little Latin flare! What’s that? No B? You sure? In Zuma’s Revenge! you play as a frog who is in some sort of Hatfield-McCoy blood feud with strange guys in tiki masks. Some sources call them tiki gods. My standard for what gets called a god is somewhat higher than a dude who spends all his free time battling frogs. All I know is that there are a bunch of beads that come from somewhere and get pushed along a string. You get rid of the beads by matching three (novel concept there) and you die if the beads reach a skull. I’m not really sure why the frog is bothering these tiki guys. I’m not really sure if the gods are crazy of if the frog is a jerk. I’m also not really sure if any of them are Zuma, or why they solve all their problems with combative bracelet making. Everything here looks fine. The game looks nicer on the DS than it does on this review’s pictures. All you really need to do here is animate circles, so there isn’t too much to screw up. It is worth noting that the different power ups have a distinct look to them and that really helps to avoid confusion. Gosh. . . um. . . This is perfectly acceptable puzzle music. Pretty good, I guess. I wouldn’t expect anybody to be humming the theme song the next day at work, but I know people with songs from Tetris on their iPods. The stylus here works really well. At first, I didn’t read the directions and was sliding it across the frog to shoot the beads at the other beads, but you really just have to touch the screen where you want to shoot and the frog will shoot there. The game handles wonderfully, and is designed well. It is easy to tell power-ups apart, it is easy to switch which bead you’d like to fire, and it is easy to slide your frog during the boss battles. The only problem I encountered with the controls was during the boss battles. 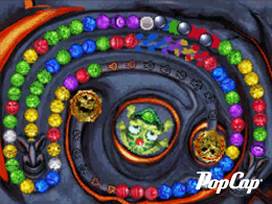 During these, you have to avoid projectiles from the tiki men while still playing the bead game in order to clear the beads in order to have open space to shoot the beads at the tiki boss. You move the frog by dragging him around with the stylus. This thing is easy to do. However, touching the frog with the stylus also changes which bead the frog is going to shoot next. During the heat of battle, it is easy to shoot the wrong ball. The option of moving the frog with the d-pad would have completely eliminated this problem. 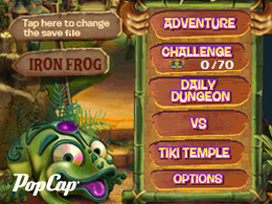 In addition to the storyline “adventure”Â mode, there is also a Challenge mode where you can unlock crowns for fast completion, an Iron Frog gauntlet style mode, and the Daily Dungeon. The Daily Dungeon is weird. You spin a slot machine and are treated to an Astro level a Blitz Level and a Boss Battle. For each day that you spin it, these levels are different. The Blitz level is just a minute long high-score fest. The Boss part just lets you replay a boss fight (provided you have already beaten Adventure mode.) Astro is fantastic, though. It’s the same game as every other mode, except in SPACE! You can’t see the path that the beads are taking which affects gameplay somewhat. But more importantly, the frog is in a spacesuit. Jason X and NewsRadio have already proven that everything is better in space, and Space Frogs would not be an exception. There are 60 levels in adventure mode, 70 levels in challenge mode, a frog gauntlet called Iron Frog, the weirdo Daily Dungeon feature, and the desires for top scores. All in all, there is a better than decent amount of replayability, here. The learning curve of this game is smooth. I went from not knowing what I was doing to developing strategies over the course of playing the first ten levels. Zuma’s Revenge! 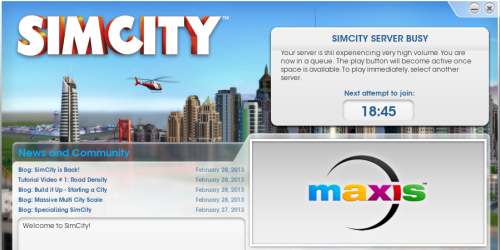 is a port of a PC game. As the title implies, that game was a sequel to Zuma. Zuma is, more or less, one of the many clones of a game called Puzz Loop. So, it is pretty original unless you’re already played a different version of Zuma’s Revenge, Zuma, Zuma Deluxe, Puzz Loop, Puzz Loop‘s port called Ballistic, its sequel Puzz Loop 2, its remake Magnetica, any one of the Luxor games, Tumblebugs, The WiiWare game Potpourrii, Butterfly Escape, or. . . Wait a second. 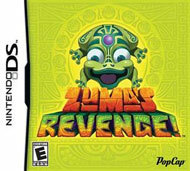 . . For a game where a frog fights tiki men, Zuma’s Revenge isn’t very original. 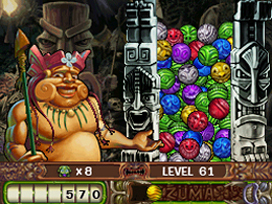 Zuma’s Revenge is a game that I don’t really want to stop playing as I’m playing it. It’s also a game that I have no desire to play again once I’ve stopped. It’s kinda like how my daughter takes a bath. She never wants to get in, but I can’t get her out in under an hour. These casual puzzle games seem to have their market. I don’t really care for them myself, but a lot of people do. Still, this seems like the sort of thing you’d want to play on your phone. It doesn’t provide a compelling reason for dragging around the DS. The game box comes with a handsome slip-cover. Sadly, Zuma’s Revenge does not feature a proper follow-up to the classic Cortez the Killer. In fact, one would not find any memorable guitar solos here. It also contains no Tales of a Sexual Gladiator.